I mentioned a while ago that my new shoes feel loose in the heels, especially when I start a run. I did find a couple of resources that have a method for lacing your shoes to prevent just this problem. Both Runner’s World and New Balance had information showing how. Instead of crossing the laces when you bring them to the final holes, you bring the lace from the second-to-last hole to the last hole on the same side of the shoe, inserting the lace from the outside of the shoe. 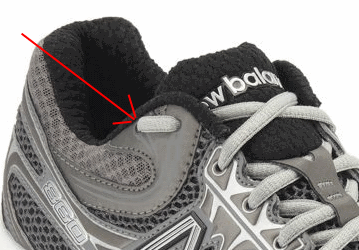 Instead of pulling the lace tight like shown in the picture, you leave a little loop. Then you bring both laces across the shoe and stick them through the loops you just made and tie them as you normally would. I’ve tried it for the last few runs and I can tell the difference–you can get the heel tight without cramming the rest of your foot. You are currently reading That’s Knot How You Tie Your Shoes at Tundra Running.